I still fondly remember my first days of being a new mom. It was a weave of emotions: contentment, bliss, anxiousness, uncertainty. After successfully placing our car seat inside our car with our newborn daughter inside, the hospital in the distance as we slowly (very slowly…) drove away, both my husband and I sat in silence and wondering in our heads: That’s it. We’re on our own now. We were young, inexperienced and although elated and overjoyed to have our little girl coming home, we didn’t know what to expect. This is so common for all new moms. I even had a whole new bout of emotions after my 2nd child was born — I even suffered from post-partum blues (see my post here). I believe it’s just the motherly protectiveness that overpowers and because we just want to make sure they’re OK.
It’s always great to have support and advice from seasoned mothers and even just solace from other mothers that are going through the same thing. I was happy to learn of Playtex Mommyville. The Playtex Mommyville Community brings new Canadian moms and moms to be together to share moments, thoughts and tips about caring for your newborn. When my daughter was born, I relied only on my mom and other family and friends and of course my doctor. There were often times that I needed some reassurance with issues that my mom or friend never experienced with their child. I wasn’t really as active online so I didn’t utilize the benefits of a supportive online community. Benefits of being a mom in Generation Z! I was happy to be chosen to be part of the new Mom Trust Program which is affiliated with Playtex Mommyville. I jumped at the opportunity to participate because I understand and appreciate how valuable a community like Mom Trust is for all new moms alike. The Mom Trust program is a virtual, North American network of moms (10 from Canada and 10 from the US). The vision for this program is to have influential moms share their stories, tips, insights and unique experiences of motherhood, while also providing reviews on amazing Playtex products. Did I mention I cannot live without my Playtex Diaper Genie Elite? Check out what a few of my readers that I gave the opportunity to test the Diaper Genie Elite had to say here. 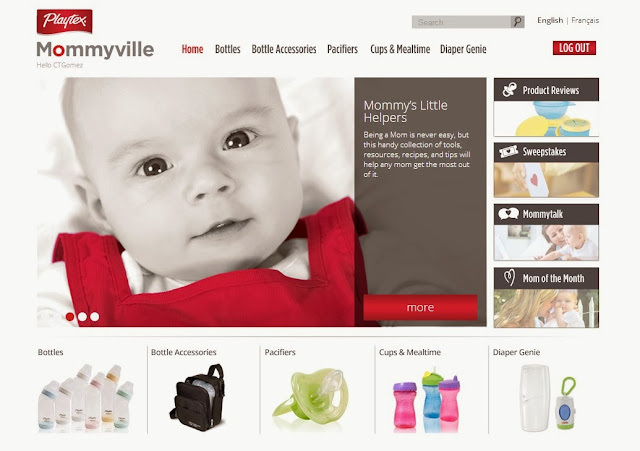 Still wondering what the advantages are of joining the Mommyville Community? To join the Mommyville Community, sign up here. You can also join them on Facebook at Facebook.com/playtexmommyville . Navigate the exciting and sometimes challenging world of motherhood with us! Take Care. Disclosure: I am part of the Mom Trust Program with Playtex and receive compensation as part of my affiliation with this group; however all opinions expressed are entirely my own. Join us for a #PlaytexKnowsBabies Twitter Party! I love the FAQ section! I love this program and have a few mommy to be friends I will be sharing this with! As a new mommy to be, I will be signing up for Playtex Mommyville after reading your post! I never tried them when my babies were little. I probably should have! honestly this is so fantastic. talking to other moms is just what we all need!! I have never heard of this but sounds great. I was good for my first 2 girls, but when my boy was born I went through a whole new set of emotions and high anxiety. I also had postpartum depression with my first. I remember how scared I was being on my own for the first time with my new baby! I was young and had no idea! I look forward to reading more about your experience! I look forward to reading your posts! I am also going to pass information about this community to my friend who is expecting. Thanks! Playtex Mommyville is a great group! I have belonged since my first twins were born and have had a lot of questions answered through them! All the support provided by Platex is great for new moms!! Internet didn’t exist like this when my kids were little. Used many online communities when I had my first. Still use them today after my 3rd. Mommyville sounds like a great forum. I wish all these sites and supports would have been around when my children were born. (they are in their 30’s), although I did have a wonderful support team around me. what an awesome idea, new mom’s really need a ton of support! Thanks for sharing the info! Carol Gomez is the owner and creative behind CAC, an online space for the cultured appetite. CAC also specializes in digital marketing, working with brands and media to help spark and amplify conversation and build strong connections and reputations. © 2019 Copyright Carol Au Courant. All Rights Reserved. Reproduction of content, including images, in whole or in part without permission is strictly forbidden.